Note. I offer no suggestions on the context. 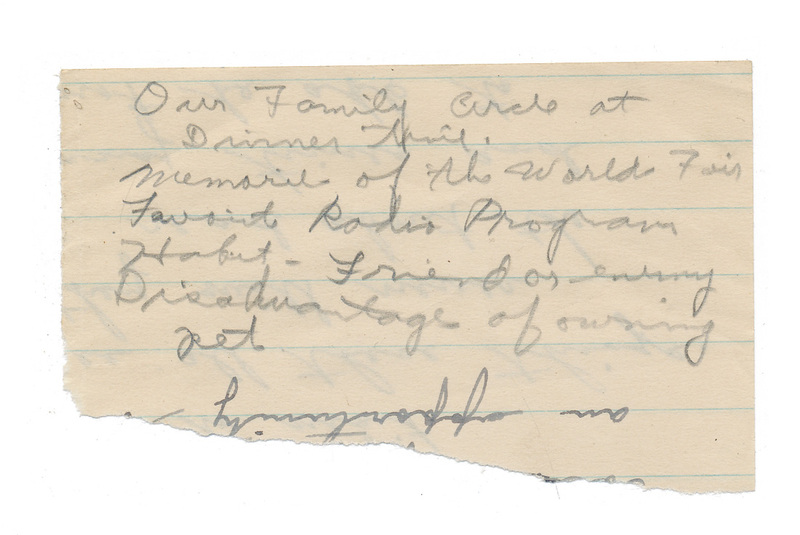 There is a bit of writing on the back, but it appears to be parts of a larger bit of writing. 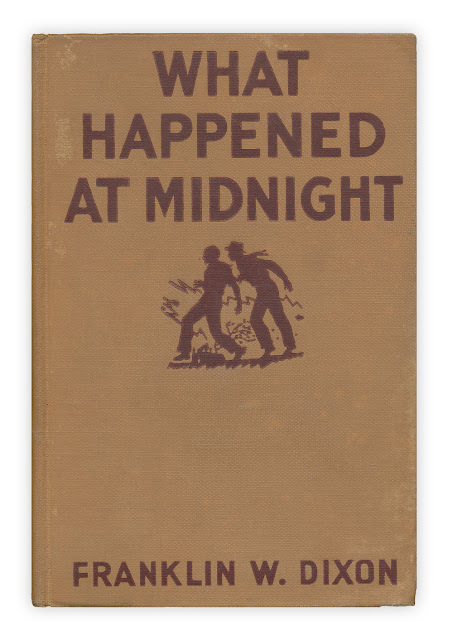 Found in "Hardy Boys - What Happened at Midnight" by Franklin W. Dixon. Published by Grosset and Dunlap, 1931. They sound like writing prompts. Conversation topics for a dinner party? I think that is "memorieS" of the World Fair (I'm also busy indexing the 1940 US Census, so I look at a lot of bad handwriting). I think they are ideas for dinner conversations around the family table. I'm just wondering why someone would have to plan their dinner conversation. I'm with Katie--I think it's ideas for family conversation at the dinner table. Doris, I don't read it as planning the conversation--just as starting points. I've got six kids, and we've used a deck of cards my daughter and I made on occasion. It's pretty simple, really--teenkids (boys especially!) don't always dive right in with conversation, and sometimes when a family sits around a dinner table, there can be silences, or long exchanges of movie quotes. Which can be hilarious at times, and at others just frustrating. This looks to me like a mother trying to engage her children and family in more formal conversation, in the manner of generations past, to teach them good conversational skills (including topics to bring up at dinner parties) and help them learn to reason and defend a position (Habit: Friend or Enemy); see alternative points of view and understand parental decisions (disadvantages of having a pet); evaluate (Favorite radio program); and feel a sense of belonging (Memories of the World's Fair). Given the handwriting (which appears to be bastardized standard script from about my mother's era) and the reference to radio programs, I'd say this was the list of a mother who had recently read an article in Good Housekeeping about using dinnertime conversation to enrich and educate. The 1950s were a time when dinnertime conversation was losing ground to TV watching, and some women's magazines were addressing this as a problem women were concerned about. Some homemakers, in response, decided to try to get their family's dinnertimes back on track...such as by renaming dinner the Family Circle and introducing a conversation starter from a list of thoughtful topics she had prepared in advance.